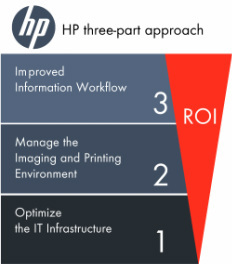 HP comprehensive Total Print Management (TPM) solutions. TPM is an integrated family of HP hardware, software and services that uses a proven methodology to help customers regain control of their printing and imaging environments, and reduce the direct and indirect costs associated with them. Direct costs include items like hard-copy devices and consumables; space and storage for devices, ink/toner and media; help desk and remote management, among others; while indirect costs comprise employee productivity, corporate costs and the like. It's that simple. Total Print Management gives you the big picture. With visibility of your whole network, you can control and manage your resources more efficiently. Total Print Management (TPM) can maximize cost savings and productivity while minimizing IT department headaches. The requirements of your printing/copying environment will evolve with your business. TPM provides flexible solutions and services to meet today's needs and those of tomorrow. create visibility into print activity and trends allows you to take control of printing costs. Control and forecast budgets accurately by setting your printing and cost up-front.